Suhanosky is the kind of chef who pours his heart into every endeavor – his last restaurant Sfoglia, which had Manhattan and Nantucket locations, was highly revered for its spirited and authentic Italian fare, and one of his two cookbooks, Pasta Sfoglia, won a James Beard award. 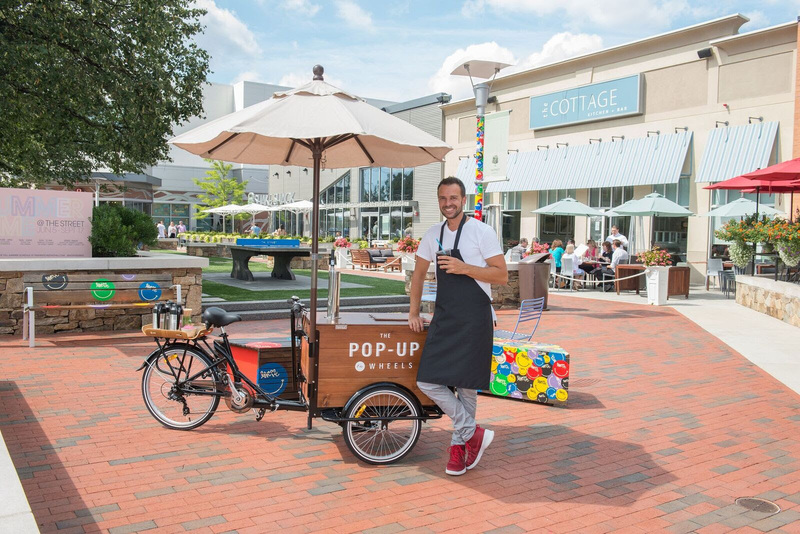 Upon moving to Chestnut Hill to be closer to family, Suhanosky set his sights on his next labor of love: The Pop-Up at The Street, located within biking distance from his home and igniting his desire to contribute to his new community. Ronsky’s at The Street is a true of its kind café that has Suhanosky’s stamp on everything from the décor to the zeppoli. He has utterly transformed the intimate space with white tin tiled ceilings, harlequin floors, walls with splashes of gold and a communal table from his great grandmother’s kitchen. The menu features Suhanosky’s personal twists on family recipes. A self-taught coffee connoisseur, Suhanosky lives by the motto “If I have a good coffee, it will be a good day,” and has sourced the finest cold brew and drip coffees as well as Italian espresso by Esse. By morning, guests will find one of the most crave-able Breakfast Sandwiches in the area, served on a black pepper Italian biscuit with eggs, fontina cheese, and a breakfast sausage from New England Charcuterie, Avocado Toast, and Nonna’s Zeppoli, a ricotta donut recipe passed down from Suhanosky’s grandmother. By afternoon, Suhanosky will be pressing ten different types of panini, served on award-winning bread from Slow Rise Bakery in Concord. Panini options will vary weekly as well as include staples such as Nonna’s Meatball Panini, Classic Italian with cured meats, salami, prosciutto and buffalo mozzarella, and Tian Vegetable, layered vegetable casserole with goat cheese on pressed ciabatta. Ronsky’s will source fresh herbs from Green City Growers’ farm beds at The Street, located just one step from its entrance. Health enthusiasts will find fresh tonics and locally made salads. Complementing Ronsky’s, Suhanosky will oversee The Pop-Up on Wheels, a custom-made, vintage style coffee trike that will travel throughout The Street with a seasonal menu; look for cold brew coffee, iced tea and select baked goods this month. Updates as to the The Pop-Up on Wheels’ location at The Street will be posted via @shopthestreet on Twitter and Instagram. Ronsky’s is open seven days a week, 7:00am-7:00pm, from September 12, 2016 through the end of 2016. T: 617-903-2159; Follow @chefronskys on Instagram.